Spent the last 8 days in New York City and New Jersey. Always an adventure! 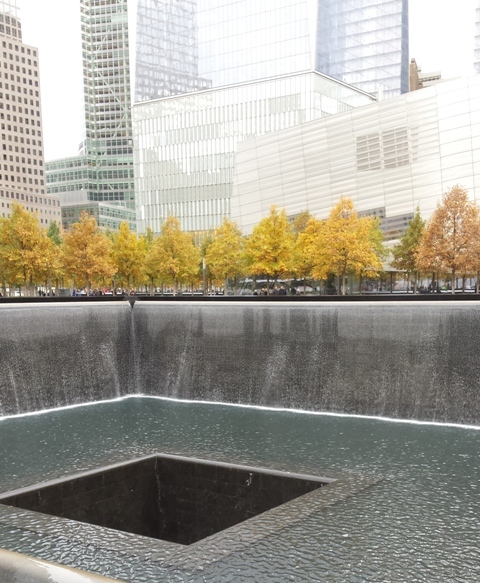 One of the highlights was visiting the 911 Museum and Memorial — Wow! Unbelievable! Amazing! Extraordinary! Touched my heart deeply! Even four hours was not enough time to see it all. Compassion was the overall feeling I experienced most. I, like almost everyone else, watched in horror in 2001 as lives ended or were changed forever; I felt numb for months. Soon afterward, I was invited to give a presentation at TCU in Fort Worth on how to deal with chaos and loss — how to go on living as joyfully as we can. I believe it’s what the departed would want for all of us. By the time September of 2002 rolled around, I was living near NYC, and attended the first anniversary memorial, amidst the destruction. I was fortunate enough to be able to pull on the rope that rang a large bell as each name was called. I was so moved that I got back in line so I could do it twice — moments I will always remember. Compassion is the empathetic concern for the sufferings or misfortunes of others, and one that motivates a desire to help. Mostly what we can do now is honor all those who lost their lives, their families and friends left behind, and the ones who helped on that day and for the many years since. I invite you to visit my website CWLauro.com to read about my experience at one of the most touching museum sections. This entry was posted in Extraordinary Places and tagged 911 Memorial, 911 Museum, Cathy W. Lauro, compassion, New York City, The Inside Advantage. Bookmark the permalink.